The post Are you getting credit for all of your organic visits from GMB? appeared first on Search Engine Land. SEO reports are often really useful… for SEO professionals. Columnist Greg Gifford asserts that if you want to truly prove the value of your services to your clients, you have to tie your reports directly to their bottom line. Columnist Greg Gifford illustrates the importance of educating your clients on different types of keywords and when to target them. The post Target the right keywords — for Google AND your clients appeared first on Search Engine Land. This is particularly true of local SEO, where a few savvy tactics for building links and relationships with other local businesses can give you a huge visibility boost in local search. According to the 2017 Local Search Ranking Factors, inbound links are the most important ranking signal. But if you’ve run through all the usual methods of getting inbound links, what can you do to give your site – or your client’s site – a leg up in search? 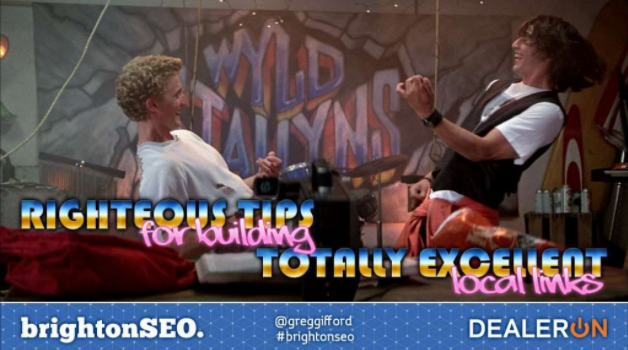 At Brighton SEO last Friday, master of local SEO Greg Grifford shared some “righteous” tips for a kickass link-building strategy, in his signature flurry of slides and movie references – this time to 80s movies. With local small businesses, said Gifford, you have to think about links in something other than pure numbers. Which is not to say that quantity doesn’t help – but it’s about the number of different sites which link to you, not the sheer number of links you have full stop. With local SEO, all local links are relevant if they’re in the same geographical area as you. Even those crappy little church or youth group websites with a site design from the 1990s? Yes, especially those – in the world of local SEO, local relevance supersedes quality. While a link from a low-quality, low-authority website is a bad idea in all other contexts, local SEO is the one time that you can get away with it; in fact, these websites are your secret weapon. Gifford also explained that local links are hard to reverse-engineer. If your competitors don’t understand local, they won’t see the value of these links – and even if they do, good relationships will allow you to score links that your competitors might not be able to get. “It’s all about real-world relationships,” he said. And once you have these relationships in place, you can get a ton of local links for less time and effort than it would take you to get a single link from a site with high domain authority. These five basic ways of getting local links encompass dozens of different methods that you can use to build relationships and improve your standing in local search. Go to meetup.com and scout around for local meetups. A lot of local meetups don’t have a permanent location, which gives you an opportunity to offer your business as a permanent meeting venue. Or you can sponsor the event, make a small investment to buy food and drink for its members, and get a killer local link in return. Find local directories that are relevant to the business you’re working with. Gifford emphasized that these should not be huge, generic directories with names like “xyzdirectory.com”, but genuine local listings where you can provide useful information. These are easier to get onto than bigger review websites, and with huge amounts of hyperlocal relevance. Similar to sponsoring a local meetup, a relatively small investment can get you a great link in return. Event sponsorships will normally include your logo, but make sure that they also link back to your site. Local bloggers are hungry to find information to put on their blogs; you can donate time and information to them, and get a killer blog post and link out of the equation. The same is true of local newspapers, who are often stretched for content for their digital editions and might appreciate a tip or feature opportunity about a locally relevant business. Local charities are another way to get involved with the community and give back to it – plus, it’s great for your image. By the same token, you also can donate to local food banks or shelters, and be listed as a donor or sponsor on their website. Much like local directories, it’s very easy to get listed by a local business association, such as a local bar dealer’s association – make sure there’s a link. These are great if you’re on the Board of Directors, or if your child or your client’s child is at that school. Again, getting involved in a local school is a good way to give back to the community at the same time as raising your local profile and improving your local links (both the SEO and the relationship kind). 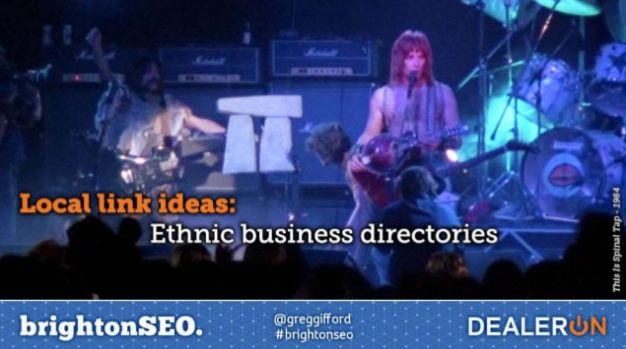 If you’re a member of a particular ethnic community who runs a local business, you can list your business on an ethnic business directory, which is great for grabbing the attention – and custom – of everyone in that community. Of course, it goes without saying that you should only do this if it genuinely does apply to your business. Gifford’s presentation contained even more ingenious ideas for local links than I’ve listed here, including local guides, art festivals and calendar pages; you can find the full list on his Slideshare of the presentation. Gifford advises creating a spreadsheet with all your link opportunities, including what it will cost or the time it will take you. Make sure you have all of the relevant contact details, so that when it comes time to get the link, you can just go and get it. Then present that to your client, or if you’re not working on behalf of a client, to whichever individual whose buy-in you need in order to pursue a link-building strategy. Decide what links to go after, and go and get them; then, after three months, wipe the spreadsheet and repeat the process. So, now you’re all set to go out and gather a cornucopia of local links, all pointing right at your business, right? Well, here are a few points to bear in mind first. A lot of times, the people you approach won’t know what SEO is, or even what digital is. 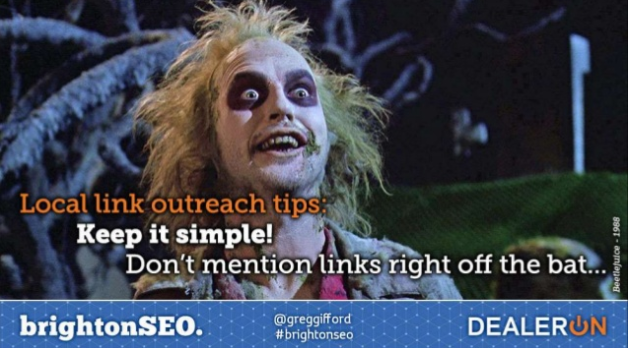 So be careful about how you go about asking for a link; don’t mention links or SEO right off the bat. Instead, focus on the value that will be added for their customers. “This is not about the link; this is about the value that you can provide,” said Gifford. Once again, for the people at the back: it’s about building up long-term, valuable relationships which provide benefit to you and to the local community. When it comes to local SEO, these relationships and the links that you can get will be worth more than any links from big, hefty high-domain-authority (but locally irrelevant) websites. Looking to build links for your local business? In this helpful how-to piece, columnist Greg Gifford outlines his process for finding and acquiring local links. The post An easy quarterly plan for local link building appeared first on Search Engine Land. Developing content for your local business website is clearly important for search engine optimization, but that doesn’t mean that more content is always better. Columnist Greg Gifford explains and suggests an alternative strategy. 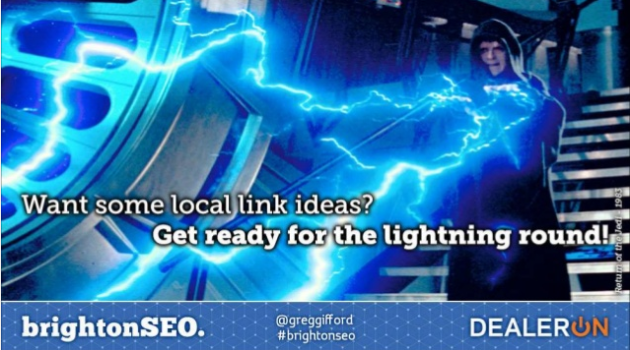 The debate rages on over the authoritative set of local ranking factors, but columnist Greg Gifford believes that local SEOs on both sides of the fence may be missing the point. The post Be a mad scientist to be more successful in local SEO appeared first on Search Engine Land. The post Need to contact Google My Business support? Use Twitter! appeared first on Search Engine Land.